Red Beach is one of the most striking beaches of the island and presents rather a rare landscape. If you have several days in Santorini at your disposal, you should include it into your route to fall in love with the island even more. 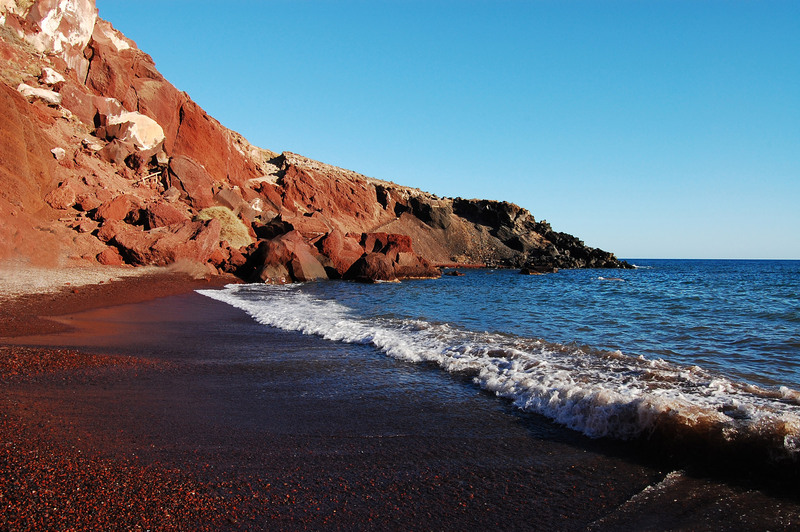 Red Beach is located in the southern part of the island, not too far from ancient Akrotiri, in a natural bay. You need transportation to get there, but you can walk from the excavations following the sign, too. When you reach the place you will see a beautiful white chapel of St. Nicolas against the dark red rocks. From here a wild path starts leading you to the place with a stunning panoramic view of the whole Red Beach and its turquoise blue waters. You can continue your walk to the beach itself following the path, although at your own risk. Red Beach presents a part of a many-thousands-year-old former volcano, therefore the beach is considered to be wild, no matter that most probably you will find there some sunbeds, umbrellas and snacks to be sold. The rocks here are not very stable and there was a rock fall a couple of times. You need to have this in mind both walking along the wild path and staying at the beach. Athletic shoes are recommended if you decide to walk all the way down. The beach itself presents a mixture of the black and dark red sand. If you’d like to swim in these beautiful waters but do not want to walk the shaggy path, use an alternative offered by catamaran tours or hiring a yacht for several hours. Such tours give you a possibility to enjoy the scenery from the boat and to swim in this clean, transparent sea away from the crowds.